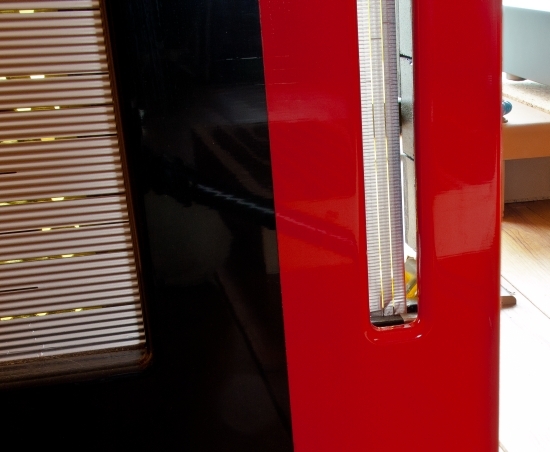 The red and black Duetta Sigs contain the older KLM2 type ribbons and are using non-standard crossovers with deviating values. 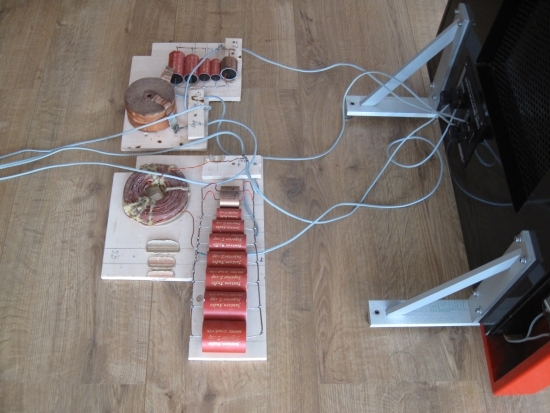 Part 3 details the change to standard crossovers and part 4 finally explains how the Duettas perform when entirely optimized by Henk van der Hoeven using Graz’ latest KLM5 MRTW ribbons with new interfaces and wired returns. Now, take a deep breath, and dive in! JW, my closest friend and listening buddy has been bitten by the Apogee bug early on. Yet, the only Apogee model he has ever had were the small hybrid Centaurs. So, I teased him for years at end that he wouldn’t be a true Apogee-adept as long as he stuck with his hybrids. In the meantime I did not want to try any full range Apogee model myself due to the horror stories on the forums about impossible loads and panel buzz. I don’t quite remember when JW’s change of heart started to set in but at some stage I saw a perfect refurbished pair of Duetta Sigs for sale and I notified him, saying that this was his moment: a perfect pair of full range, worry-free Apogees. But still he had doubts, so we arranged with the seller that we would first only come for a listen. 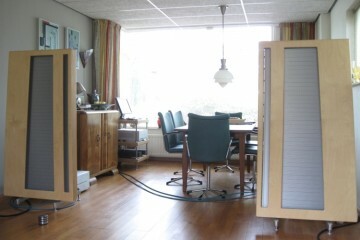 We brought along Jeff Rowland amplification and had a listening session at the owner’s home. The owner in question was Toine Dingemans (known as ThingMan on forums) who himself had a long history using various Apogees and there are plenty colourful photos of his setups floating on the ‘net. The Duetta Sigs under review were refurbished (new KLM2 ribbons) by Henk van der Hoeven, official Dutch restorer. Additionally, Toine himself has made new crossovers, based on the values of the original, but omitting the treble energy switch and associated circuitry, as well as some of the capacitors, effectively fixing the treble on a unique “extra high” setting, which would later prove to be rather too much of a good thing. Toines own amplification at the time of our visit consisted of a passive preamp (I forget the brand), Prefer and vdH cabling and an Usher poweramp, with an Olive music server as source, because his Marantz CD player was away for repairs. First we listened to his own setup. All it took was 1 minute for us to realise that 1. these speakers really do have sublime bass and 2. in spite of some hardness in the midrange and some coarseness in the treble, one of us was likely going to buy these speakers, if not JW, then I would want them myself. 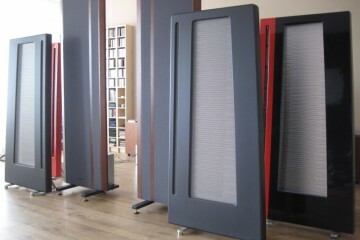 For in spite of their roughness, it was clear that these speakers do have sufficient treble openness. They did not sound dark like the pairs of Divas that we heard, or boxy like the Centaur Majors. Instead there was natural, free-flowing sound with incredible bass power. 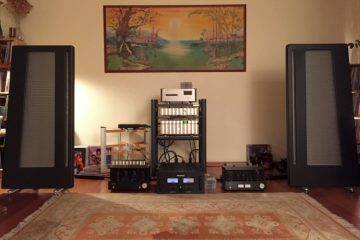 We were curious to find out how the Duettas would perform with the Jeff Rowlands, so we switched from Toines own amplification to our brought-along Jeff Rowland Synergy 2i pre and model six poweramps, connected with Transparent Reference XL interconnects but still with Toines vdH speaker cables, as these were hard-soldered to the crossovers. The difference wasn’t subtle. 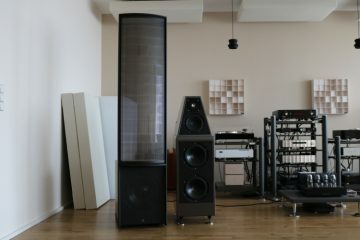 All but gone was the hardness in the midrange, treble lost most of its grain and gained air and bass became even tighter. Also, soundstage layering and front to back imaging was now greatly improved, as was low level detailing and overall smoothness. We were pretty impressed and by now I was 100% certain that even if he did not say anything, JW was definitely going to buy them. So, JW paid Toine and we loaded the speakers in his car. We agreed that although JW is the owner, we would first set them up in my system, for an extensive comparison to my own Magnepan MG3.6R’s. 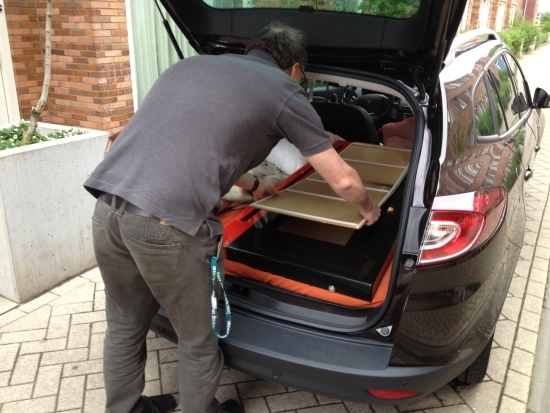 Above: JW loading the speakers in his car, using a protective sheet of thin MDF outfitted with soft draught strips, to prevent scratching. 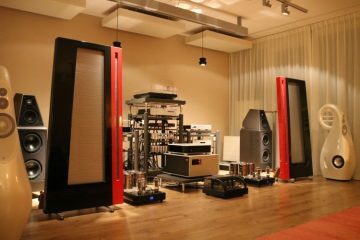 The Duetta Sigs sounded pretty impressive at Toine’s but once set up in my own listening room, the sound was even more captivating. Even set up right in front of the Magnepans (that were at first still in their old positions) the Duettas already performed very well on various aspects and only seemed to lack ultimate focus, imaging and soundstage layering. But in this compromised position we already heard more air and a lot more refinement than in Toine’s environment. This is probably mostly due to my components and cabling but likely also a function of the larger area. Set up at first did not seem that critical but in hindsight that was only because I already knew the best positions for the Magnepans and simply put the Apogees in the same spot and worked from there. We would later find that we already found the best spot for them on that very first evening, which is around 30cm more forward from the Magnepans, with the tweeter ribbons in almost the exact same location and with zero toe in. Opinions differ on the latter but I have to agree with the majority that no toe in sounds most coherent and gives the best balance between direct focused energy and room-filling sound. If desired, some toe in will work toward getting a more focused, direct-coupled sound, but it will also exaggerate bad recordings and would sooner make for listening fatigue. Above: Crossovers as we got them from Toine: low and high on separated boards. I would later make nice box for them. It is at this stage probably good to note that these refurbished models with their new crossovers sound quite different from the original models, but I’ll get into that in detail further below. For now I will only say that the refurbished models sound more upbeat and dynamic, and more “live” than the first pair of original Duetta Signatures, which sound somewhat filtered/rose-tinted. 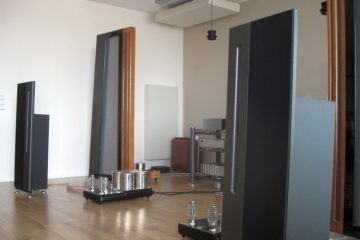 Tilting proved very important: having one speaker “off” by only a millimetre can throw the balance off dramatically, but this is easily adjusted by glancing from the side across both speakers while turning the spikes. 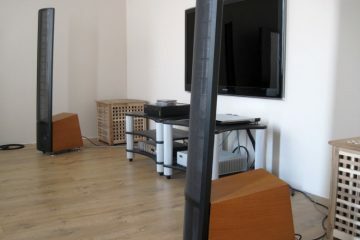 Toine chose to use van den Hul carbon-lined speakercable (Skyline Hybrid) and hard-soldered this to both ends of the crossovers, which meant that at first I could not connect my usual Transparent Reference XL speaker cables and had to just use the cheap vdH cables. Listening to the speakers like this made me re-think loudspeaker cables in general. 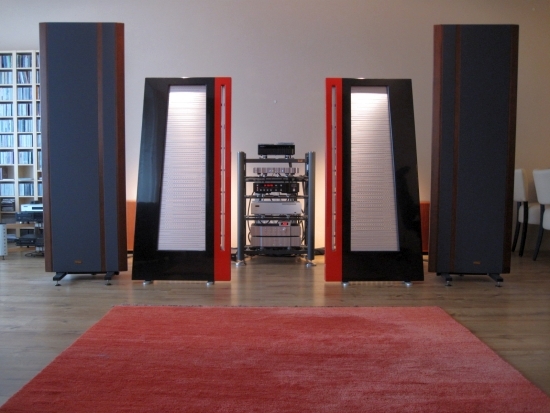 With the Duettas playing so well, would you really need exotic cables to get the best from a system? I left further experiments for later while I pondered about adding terminals to the crossovers in order enable adding my Transparent Loudspeaker cables to the mix. More about that further below. Comparing these Apogees to the Magnepans makes for some very interesting observations, because in spite of similar underlying technology, the models sound very different and have different strong and weak areas. 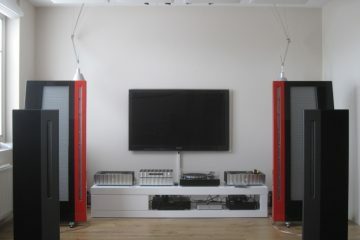 The Apogees were listened to with their captive, biwired van den Hul Skyline Hybrid cables and the Magnepans were used with their usual Transparent Reference XL speaker cables. This may seem unfair, but things are a little different than one might expect. I’ll explain further below. Please keep in mind that we are still dealing with Duetta Signatures with unofficially modified crossovers, and that by now (months after this review was written) I feel that using these incorrect crossovers the midrange and lower treble has a hard edge and is too forward. First difference between the Duettas and Maggies is in their dynamic behaviour: where the Magnepans are easy on the ear and smoothly restrained, the Apogees are much more expressive, both dynamically and rhythmically, sounding much more akin to a live concert. 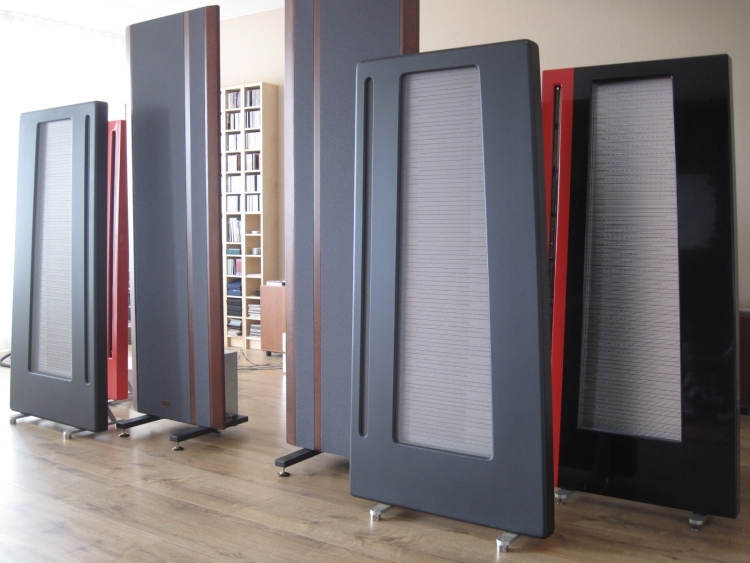 On the other hand, the Apogees can sound a little over-enthusiastic and can even sound hard or edgy and sometimes even metallic in the midrange and treble. The Magnepans clearly have the advantage with their true ribbon tweeters. The Apogees’ treble is still better than that of most dynamic tweeters but compared to that of the Magnepans, it is coarse and edgy and lacks fine detail and air. That was a surprise because while I always knew that the Magnepans were very airy, I did not expect the Apogees to be any less in terms of finesse and resolving power. 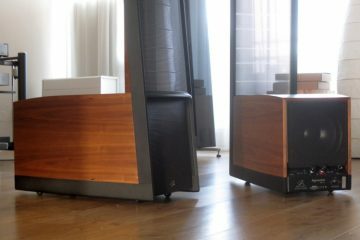 But smooth and airy treble isn’t the only thing in the audiophile world and what the Apogees give in return more than makes up for this. Firstly their unbridled enthusiasm and live-like sound. Second: their bass! Really, I swear that these speakers have the sort of bass that makes one think that the subwoofers are on. Not only did I fall for that: all my friends and visitors did as well. Without exeption they asked if the subs were still on. 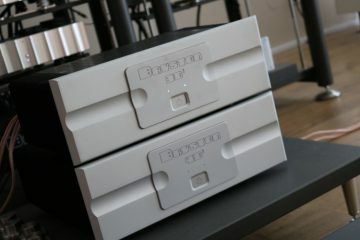 You will probably not believe what Restored Duetta Sigs are capable of until you hear a pair for yourself. At least I did not believe what they told me prior to my personal experience. The Duetta’s bass is powerful, fast, articulate and very deep. The manual states that they go as low as 30hz and you better believe it! Not only do they go that deep; they also manage to have a lot of power that low. Switching to the Magnepans without subs makes them sound like small standmount speakers! Really, this is not an exaggeration: while the Magnepans are very articulate in the bass and also go quite deep, their foils just are not allowed enough excursion to really make waves. The Apogees’s bass foils on the contrary can move lots of air and are quite fascinating to observe while playing loud house tracks. Speaking of which: the Duettas love Deep-House and encourage louder and louder playing. The speakers go amazingly loud but do have limits. If you push them too hard, the foil will break up and start to flabber in an uncontrolled manner, not unlike the effect with normal dynamic speakers. The Magnepans handle that differently and like Martin Logans just seem to dynamically compress without any apparent distortion. Apparently, if you then push them further, the Magnepans will blow their midrange and or treble fuses, but I haven’t had that happen to me yet. But there’s another important difference between the Apogees and Magnepans: forgiveness. The restored Duetta Sigs are very, very picky and not forgiving of mediocre recordings. I suspect that their treble and midrange is more honest than that of the Magnepans. But with roughly half my collection standing out that way, there’s bound to be something else, too. So, while the Magnepans may have some additional treble smoothing going on, the Apogees do add some roughness, in addition to working like a magnifying glass for recorded imperfections. 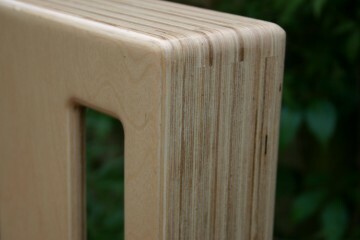 They seem to enhance sharpness similar to the way that is possible using image software like photoshop. Artificially sharpening an image doesn’t really make it sharper; it just adds edge. While on balance the effect in reality isn’t nearly as bad as I now make it sound, this does have annoying consequences: virtually my entire collection sounds fabulous on the Magnepans, but on the Apogees a lot of CD’s are just not enjoyable anymore. But this goes both ways: loudly recorded, clipped R&B sounds remarkably well-mannered and very enjoyable through the Magnepans and unlistenable through the Apogees while the simplest live recordings consisting only of guitar, piano and vocals can be truely captivating through the Apogees and mildly boring through the Magnepans. Ultimately I think the Magnepans add some refinement that isn’t really in the recording, but is very pleasant nevertheless. They’re incredibly easy on the ear, as also evidenced by one friends with old, warm-sounding B&W DM6 speakers and another with Sonus Fabers, who both very much enjoyed my Magnepan sound and are both now a little let down with the more accurate/more agressive Apogee sound. But for me that doesn’t matter. I like what I like. But there’s no denying that the Magnepan’s mild manners can definitely add to the enjoyment. Their restraint however can also work against them, turning to a slightly veiled quality and the sense that music isn’t really set free. 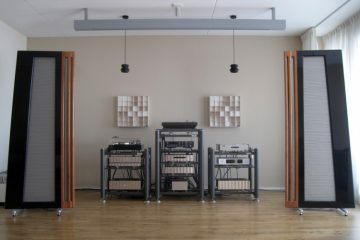 However, the Magnepans do sound bigger than the Apogees, in all dimensions: they easily fill the room with ambient sound and they have a very, very wide soundstage. 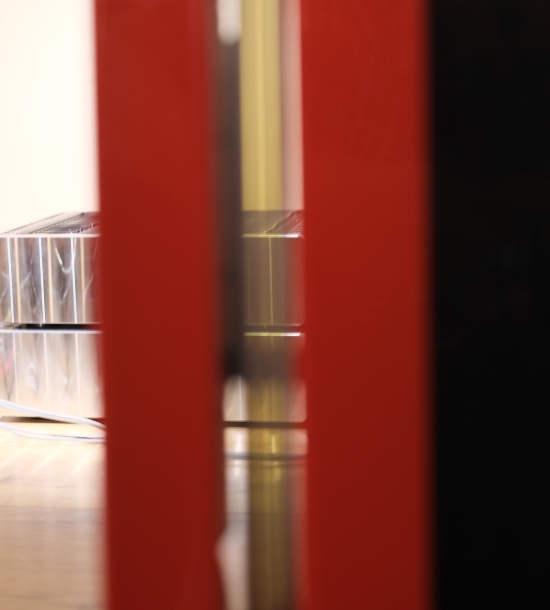 The Apogees have a smaller, more concentrated soundstage but with better focus and depth layering. Compared to original (not modified or refurbished) Duetta Signatures, still the MG3.6R’s are gentler and more fluid in the treble. Soundstaging was indeed sometimes wider on the Magnepans, but not more focused or better layered. On all other accounts, I’d say that the Duetta Sigs totally cream the Magnepans. Importantly, the Maggies aren’t really more forgiving than the original Duetta Sigs at all. It’s just that it can seem to be this way due to the wrongly modified crossovers of the refurbished models.